The discussion at the Board was quiet upbeat and straightforward, and it repeated the type of statements we have already seen about a general contentment with ridership growth. Things got more combative in the media scrum after the meeting when Oliver Moore from the Globe & Mail pressed Chair Rob Prichard and CEO Bruce McCuaig on the numbers noting that the “increase” between September and October can entirely be explained by the relative length of the months, not from actual growth. After the meeting was over, Metrolinx updated its detailed breakdown of daily ridership. A few things show up when looking at this in detail. The “Actual” line is charted directly from the Metrolinx data. The “Weekly Average” is calculated from the previous seven days on a rolling basis. Although October’s total ridership was 79,010 as compared to September’s 76,438, this is entirely explained by the fact that October contains one more day. The daily averages over each month are almost identical. Moreover, October saw a spike in usage over Thanksgiving weekend which pulled up the monthly numbers, but there has been a steady downward trend since. A further problem showed up in comparing the new report with previous data in that figures for September are now higher than originally reported. The numbers we provided in September were based on an automatic passenger counter system at Pearson station. This methodology provides more timely information but is based on raw counts that are discounted to exclude non-revenue movements (e.g. train staff, cleaners, etc.). We can therefore expect some adjustment in the recent numbers when an updated report appears in a few months. I will leave it to readers to ponder why there is a six week delay in reconciliation of these data. Note that the first chart above uses the revised data as its source for September. Why was this information not before the Board? 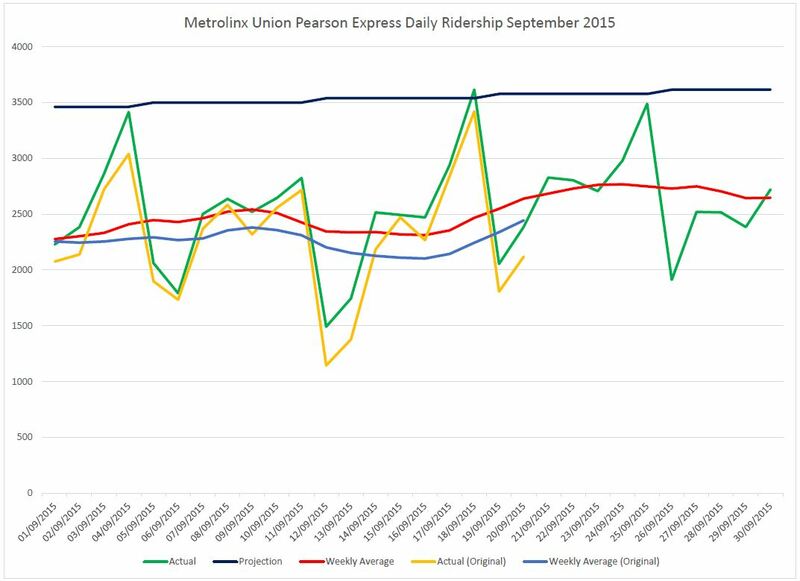 Why was detailed data that would have clearly shown a ridership decline in late October not reported, but an “increase” that is entirely the effect of the calendar touted as an example of UPX growth? This borders on misrepresentation, and Metrolinx management would do well to have accurate, up-to-date information in place before Board meetings rather than releasing the data afterwards. Again, I must ask, what is the Board doing about this? The Metrolinx board is not noted for long, let alone contentious, debates; even moreso, the idea that the Board would reject a management recommendation is unheard of. Today was different. Who, outside of the station neighbourhood, actually knows where some of these locations are? What are the “policies” about naming and have they been followed consistently? Why are some stations named for locations that are actually some distance away? Should the primary function of a station name be to tell an unfamiliar rider where it is located, not to placate each neighbourhood with their own “local” name that is meaningless to the wider travelling public? Nobody on the Board knows where “Fairbank” is. Most of the Board appears to know that “Forest Hill” is actually closer to Chaplin than to Bathurst. A Board member well known for supporting many good causes in Toronto did not know that the TTC already has a “Bathurst” station on the Bloor-Danforth subway line. Nobody, in discussing station naming elsewhere, picked up on the fact that many cities name major intersections as “squares” or “places” with a completely different name from any of the intersecting streets. Everyone knows these locations by name, and stations are named accordingly. In other cases, major local features supply the identity. In relation to New York City, many stops have duplicate names, and they are distinguished by which line they serve, or sometimes with a qualifier such as “42 St/Port Authority Bus Terminal”, “Times Sq-42 St”, “42 St Bryant Park” and “Grand Central 42 St”. This does not appear to be a sufficient precedent for Metrolinx staff who insist on uniqueness and an absence of compound names. There is a “policy” for station naming that has been agreed to by all of the GTHA transit agencies, but (a) this does not appear to have been approved by the Board and (b) Metrolinx staff feel free to change it as needed on the fly. There was a lot of talk about why some names were changed, notably the Eglinton West / Allen / Cedarvale transition. Who, after all, knows where “Cedarvale” is, especially in relationship to Eglinton when the ravine is somewhat to the south. This entire debate arose because Metrolinx decided that the compound “Eglinton West” did not fit their new design. Had they left well enough alone, this discussion would not be necessary. Similarly, compound names such as Dufferin/Eglinton would have avoided the need for delving into local geographies, or pulling names from nearby streets to do extended duty (for example with “O’Connor” standing in for Victoria Park/Eglinton). Lebovic Station had its own small debate because the TTC proposed (actually one Commissioner pushed through a motion) that this be renamed Hakimi Station. Both names honour local industrialists with Lebovic referring to the original builder of the neighbourhood. Meanwhile, Centennial College has proposed “Ashtonbee” after their campus name, although the actual street does not cross Eglinton. Metrolinx staff rejected this idea. What was quite clear was that Metrolinx staff came up with a naming scheme that sounds good on paper, but does not work in practice. One might almost suggest that it could have been designed by someone who never used transit. Several Board members noted that the function of transit is to get people to places around the city, and that to do this, stations should have recognizable names. Adherence to the proposed “policies” works against good customer service, a topic on which Metrolinx prides itself. The matter has been sent back to staff, although there is an urgency because Metrolinx claims it must nail down the names as part of its contract with the Crosstown’s builder. Yes, children, the line won’t open for at least six years, but we have no time to reconsider a bad staff recommendation. This was not Metrolinx’ finest hour by a long shot, not least because the Board expended considerable time on a relatively minor issue while letting major policy and oversight matters drift through almost without debate. During the press scrum, Chair Rob Prichard said that there had been meetings of Metrolinx committees yesterday at which all the details of things like fares and UPX had been dealt with. Sadly those meetings are not open to the public, and in any event, based on what was presented to the Board, the Committees left management’s proposals unchanged despite their flaws. This is what passes for governance and public transparency at Metrolinx. What remains to be seen is whether the Board recognizes the degree to which it has abdicated responsibility for policy, for actual debate and decisions, not the rubber-stamping of staff proposals. The Metrolinx Board will meet on December 3, but this will likely be the usual tame affair with polite conversation, management reports accepted unquestioningly, and profound self-satisfaction at a job well done. Were there actually scope for controversy, let along for presentations by non-members of the Board, there are interesting topics on the agenda. 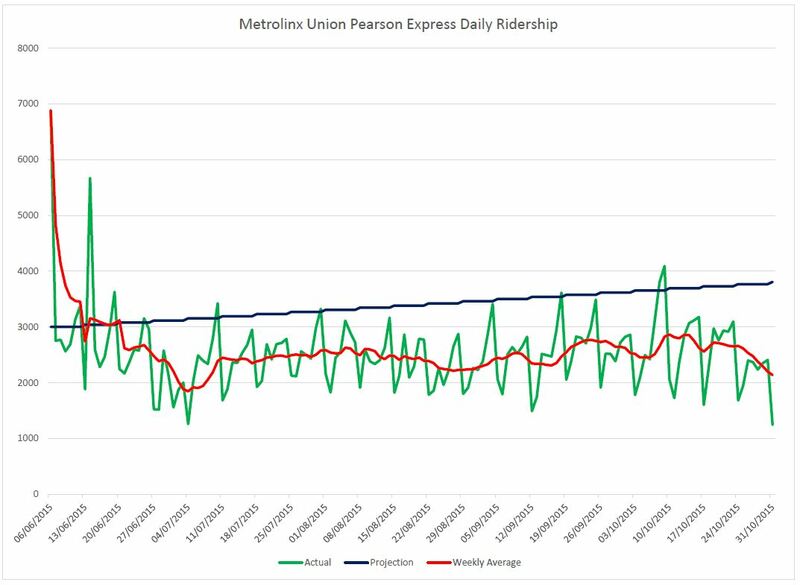 I have already discussed the update on UPX operations and the manner in which ridership growth is presented to look better than it actually is. This is a service badly in need of a rethink of its entire business model not to mention the bloated staffing compared with ridership counts. That won’t happen, and I expect Metrolinx will forge ever onward trying to find new riders for the service. In the interest of transparency, especially with the promotions now underway to bump riding, it’s time that Metrolinx reported not just the raw ridership numbers, but the node-to-node breakdowns and the average fare paid per trip. There is no point in having a target ridership at which operations will “break even” if this goal was based on a higher average fare than the one they are now collecting. 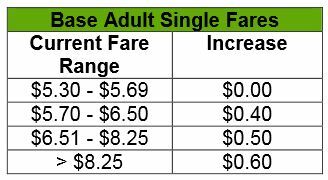 Once again, GO Transit is increasing its fares, and doing this under the pretense that this is actually a “tiered” increase. GO’s big problem is that its long trips are underpriced, and although the absolute increase in fares is higher for these, the increase per kilometre is not. Sean Marshall has written about the inequities in GO fares in detail on his blog, and he reviews the proposed 2016 increase showing that it is really more of the same. GO claims that it is fare by distance, but that is only true in a very coarse sense. Marshall proposes a new formula for GO fares with a standard, fixed base fare plus a per-kilometre increment (discussed in detail in his article). Metrolinx really owes everyone in the GTHA an explanation about their fare structure while they are busy telling anyone who will listen about “regional fare integration” with the Presto card. GO is the worse offender. All streetcars will be PRESTO-equipped by the end of 2015. Self-service machines allowing riders to reload their PRESTO cards are now appearing at various subway stations of which 23 (1/3 of the system) will be equipped by year end. New TTC fare gates are planned for both the primary and secondary (automatic) entrances of subway stations. Testing will begin at Main Street Station in 1Q16. By the end of 2016, all TTC station entrances will be able to accept PRESTO. Test PRESTO installations on buses will include readers on each type of bus before the end of 2015, and the rollout through 2016 will be on a garage-by-garage basis. Preloaded PRESTO cards are now sold at five subway stations, and the TTC will add these to the mix of media available from pass vending machines. In a related announcement, the TTC will switch to Proof-of-Payment fare collection with all-door boarding on all streetcar routes effective Monday, December 14, 2015. There is no update yet on the implementation of “transfer” logic in the PRESTO implementation on TTC, and each “tap” charges a separate fare. Riders needing to transfer must obtain a paper transfer. This is likely to be very confusing for people transferring between streetcar routes and subway stations. Publication of instructions for PRESTO usage during the transition period until complete conversion by the end of 2016 is long overdue. Its absence is a major shortcoming in “customer information” by both TTC and Metrolinx. An underlying problem is the long wait for a TTC approved fare structure taking into account PRESTO’s existence, although a report on this subject might be on the December 16, 2015 TTC Board agenda. This gets into both TTC internal budgetary and operational issues such as the effect of a move to a time-based transfer, and PRESTO issues about system capabilities and configuration, and should have been a matter of public discussion months ago. The naming for stations on the Crosstown LRT line have evolved from their original versions dating back to the Transit City studies, interim proposed names from Metrolinx, and the now-recommended names based on public feedback. Lebovic Station was the subject of a request by the TTC Board to change its name to “Hakimi”, effectively picking up the north leg of the street rather than the south leg. This was an odd motion, and its approval was more a matter of placating Commissioner Glenn De Baeremaeker after a long debate on the TTC’s budget rather than a deeply considered idea of substance. Update: Centennial College has written to Metrolinx asking that the stop at Lebovic/Hakimi be named after their Ashtonbee campus which is nearby. They do not propose a specific name, but given that Ashtonbee runs parallel to Eglinton, a compound name such as “Centennial College / Ashtonbee” might be better. This actually begs the more general question of how stations that are or will be beside campuses of various institutions might be named for uniqueness. Metrolinx appears to have abandoned part of its original scheme for stop naming which would use the format “A & B” for surface stops at intersections where there was no nearby landmark. Thus, the Wynford stop went through an interim period of “Wynford & Eglinton” and is now back to “Wynford” again, while “Leslie” wound up as “Sunnybrook Park”. Some proposed changes did not “stick”, and the recommended names are the originals, notably at “Avenue” (Avenue Road). Much research work is underway, but there is little to report for this quarter, notably any update on the parallel studies of GO/RER, SmartTrack and the Scarborough Subway Extension. Development of a preferred regional fare structure continues with the refinement and analysis of the Fare Structures reviewed by the Board in September. The Technical Advisory Committee of municipal representatives continues meeting regularly to provide in put to the work. Working together with York Region Transit, Brampton Transit, TTC, and GO Transit, plans are being completed for collecting transfer fares for trips using the Toronto-York Spadina Subway Extension to travel to/from York University and York Region BRT stations. These business requirements will be used by PRESTO to advance the required enhancements to the PRESTO system for the 2017 subway opening. This is an odd statement considering that there is an existing agreement between Toronto and York Region for fare revenue and cost sharing on the Spadina extension. If there is a change in fare structure, such as the provision of an overlap common fare zone between the two regional systems, then the original model for the TYSSE’s revenue may no longer hold. For many years the TTC expected to operate this line at a substantial loss, and any move to “integrate” fares by reducing the cross-boundary burden is likely to further deepen the hole the TYSSE will represent for Toronto’s transit budget. Thanks for the shout out, Steve! But one minor issue – but the link to my blog goes to the GO Transit fare increase board report a second time. Steve: Fixed. Thanks for catching this. What is going to happen to GO stations with duplicate names? Is Eglinton GO station going to be renamed? Steve: As with so many things, Metrolinx has ideas about how other transit systems should behave, but is silent on application of their schemes to their own network. A related problem will be one of precedence. The TTC’s “Eglinton” station was there first, but there may be cases where the existing name should be on GO’s network. There may also be cases where a future station name should be “protected” as being more important, once it exists, than some other new or current station. Torontonians need integrated GO-TTC fares within 416. Why should transit riders be penalized by paying twice for doing the right environmental and urban living choice by taking transit? Furthermore, taking Long Branch GO station as an example, a cash fare to Union is almost $6. TTC cash fare is $3. To take GO transit then TTC will cost THREE TIMES the TTC cash fare, nearly $9. But it would vastly increase the distance a rider can cover by transit in Toronto. Has there been any discussion or rumor of adding a “905” fare zone on the TTC to address the situation introduced by the TYSSE? Steve: The original plans were that the TTC “Zone 1” fare would extend to Vaughan Station, and that it would be a separate York Region fare from there on. TTC would get to keep all of the revenue in return for carrying almost all of the operating and capital maintenance costs. This did not sit well with, among others, York U students who now pay only a York Region fare to reach the campus, but would now face a two zone fare. The entire matter of a zones around the TYSSE has never come forward as a public issue at a TTC Board meeting because it opens a real can of worms. First, the TTC will lose money on the operation from day one, and this will become part of the TTC’s operating deficit borne 100% by Toronto unless another government chips in. Second, any zone arrangement to make it cheaper for York Region riders to get into the north end of Toronto (i.e. to York U) would reduce the TTC’s fare revenue from what they were expecting to get, and add to their deficit. Quite bluntly, I think York Region is too cheap to pay what it would cost to actually operate subway service into their territory, but are happy to ride on Toronto’s dime. GO did not name those stations but CN did. The regulations were (and probably still are) that no two station in Canada on the same railway could have the same name. CN had to rename one or two stations in the boonies so that the original set of GO stations could use the name that they are using. It would almost take an Act of Parliament to rename a railway station. Just about every switch or crossover is at a named station or in a named yard. If you can find the history of the start of GO it explains this. It is indeed disappointing that there has been no information about transfer procedures for when Presto goes online on the legacy streetcars. I’ve been looking forward to using Presto more often on the TTC – while Presto does have many issues and limitations, it’s still more convenient for me than buying tokens. But if I have to tap on a King streetcar and get a paper transfer at the front of the car, then using Presto is hardly any improvement over using tokens. Meanwhile, the TTC keeps talking about how all-door boarding will speed up the streetcar fleet. Sure, but if I can’t transfer from the subway to a streetcar, or vice versa, with my Presto card, then all-door boarding is something I can’t take advantage of as a Presto user. It would be nice to get clarification on this issue, especially since POP is coming to all streetcar routes in less than a fortnight. The choice of O’Connor is a welcome surprise. Changing Allen to Cedarvale is really unfortunate (is Eglinton West on YUS going to be renamed Cedervale too? If not, this makes even less sense). Steve: Yes, Eglinton West will be renamed so that the entire complex is “Cedarvale Station”. But the worst still is ‘Eglinton’. Clearly, it should be ‘Eglinton-Yonge’ to refer to the entire station, and preferably ‘Yonge’ on the platforms and when specifically discussing the ECLRT. Brad Ross indicated via Twitter that the transfer will be managed on the card, so no paper transfer should be needed from streetcar to subway. How this is actually implemented remains to be seen. If a complex set of “permitted transfer” rules is programmed into PRESTO, there will undoubtedly be situations where service irregularities and the like result in double fares being charged due to unforeseen transfer scenarios. Even a streetcar operator programming the wrong route setting into the onboard terminal could be enough to throw off the system. The problem with any automated system like PRESTO is that it removes any degree of discretion for a fare collector to wave a passenger through in these irregular situations. The more customer-friendly option, of course, would be to just implement a two-hour timed transfer on PRESTO. I hope that we will at least end up in a somewhat sane middle ground where rather than trying to enumerate every possible valid transfer scenario, the system just implements some broad rules. e.g. allowing any transfer from streetcar to subway, but not allowing more than one entry into the subway system on a single fare. Steve: The TTC is terrified of losing revenue through a two hour transfer, and all discussion of this option seem to head into a black hole. The result will be a complete mess because of mixed operation of Presto and non-Presto vehicles/routes on the system. It’s not enough to “know” the transfer rules, but to be able to deal with the “gaps” between routes where a legitimate (but paper, or even free) transfer has occurred. A simple example: Spadina streetcar (Presto) to Bloor subway (free transfer) to Dufferin Bus (needs paper transfer, but when converted, also needs to accept a “Spadina car” transfer as valid). Part of me wants this to be a stunning example of well-thought-out implementation, but part of me actually wants it to be a complete disaster to force the issue that some of the turf wars and limitations of policy options behind the scenes can fundamentally screw this up. The politicians don’t appear to understand this because they are being told that everything is just going great. Denison Road underpass opened today, between Weston Road & Jane Street. They are still working on the parking lots north of it. Everyone complains about pricing, but access is still an issue. At Dundas West, the taxi turnaround is still not complete, nor is a pedestrian walkway from Dundas, going east to the station. So the only access is via the awkward underpass entrance. Of course, the much bigger issue is the lack of direct escalator access from the east end of the subway platform. Apparently this was hindered by a reluctant owner at the Crossways. So we’re left with the world’s worst transfer point. Fixing that would help. Does Metrolinx even care to finish the “transit hub” they proudly announced many years ago? Steve, as I read your response to Saturn V, it appears that when the Vaughan extension is implemented, the fare situation as per the current agreement (TTC and YRT) would be exactly the same as when the BD subway extensions were put in to Warden and Islington, as the 2 zone system was still in force. Steve: Similar, but for the fact that Scarborough and Etobicoke were part of Metro Toronto and so there was no issue of operating the subway “outside” of its owner’s jurisdiction. Yes, there was an extra fare, but all revenues and costs stayed within Metro Toronto. As for the York U students having to pay 2 fares to travel from York Region to the university … the Vaughan MC station will have the VIVA routes that serve York (center of the Orange and Purple) right now, looping there. The Purple carries a considerable amount from Markham and Richmond Hill. This is part of their worry. Steve: Yes, their worry, but York U was heavily involved in getting that line built, and the fare structure was agreed to by York Region and Toronto years ago. This should not be a surprise to anyone who has a memory. Apparently, the Highway 407 station is only for intercity bus services to terminate. If this is right, they will be pissed for the extra fare. Pioneer Village station which is on the north end of the campus, but still quite convenient to navigate, walking wise to York U, will be the major terminus for a lot of the YRT routes going to York. Current TTC routes will be taken over by YRT and loop here from the following streets … Keele, Weston, Jane, Dufferin, Jane Local (industrial route), Thornhill, and King City. Some of these are currently operating into York, it’s just that they will be looping away from the main campus. I know it’s not that far away, as I have dropped off and picked up my daughter at the parking lot next to the construction site! Steve, this is all mentioned in YRT’s site (under one of the future plans). Now there is one I still haven’t mentioned … YRT is still planning to run a York U Shuttle (route #101) from Richmond Hill transit centre to York U, which is the current routing of the current VIVA Purple to York U. So, that one fare option will still exist … but it will depend on how many buses YRT will put on this service and the others!! The York University station will drop you off in the campus … Pioneer Village drops you in the north end with a walk. Steve: At this point, nobody has bothered to update the TTC Board on operational plans for the TYSSE and various bus routes, let alone discussed the revenue and cost implications which are considerable for Toronto’s budget in 2017 and beyond. POP is a pet peeve. Part of this is that it masquerades as the honour system but really there’s no honour in it since riders is subject to suspicion and inspection. I’d rather be refused entry to a vehicle than be thrown off and fined. Before, forgetting your transfer cost you another fare to make your connection. Forgetting a transfer on a POP route can cost you a lot more. I’m fairly convinced POP has no benefits to riders, only serving to 1 scale the TTC’s ops without scaling fare collection and 2 recoup extra cash from more offenders. POP on all streetcar routes? POP you, TTC. The station name that’s really bugging me is that they went with Keelesdale over Trethewey. Come on, Trethewey Drive ends right there and there will be a new Trethewey bus turning around at that station. It’s not rocket science! I was surprised too. I jokingly suggested it in 2003 when the station names for an Eglinton Subway was discussed on the transit-toronto email list. I first wrote about this back on September 3, 2008. In some non-official circles, I have heard suggestions that there will be something in place using Presto with a tap-off process at York-U station that would prevent charging for those who boarded at VCC, 407, or Pioneer Village stations. Knowing the way Presto deals with GO fares, one’s e-Purse would be deducted at tap-on, and then refunded back with the tap-off. Though it could be done, I have heard of no official word that this is in the plans. Furthermore, just how practical is it to have a tap-off requirement at one subway station when the norm is to not do so in the rest of the system? Or will tap-off become necessary everywhere because it is needed at one station? It will be interesting to see how this develops. After 12 years in Toronto I finally needed to take GO Transit this week on a counter peak to Bramalea. “I’ll buy a preloaded Presto card when passing through Union TTC”. Nope, TVM lists as “not available” (Suspiciously wonders about it being Metropass season and whether Presto has made way for more Metropasses for a few days). Oh well, I can buy it at GO. On the way back I transfer at Union to a Stouffville train. Presto material is silent about train-train transfers, would have been more reassuring if it explicitly said “no tap at Union if you’re transferring”. I get off at Danforth and schlep over, in the drizzle, to Main, Presto in hand. Nope, not a single fare reader installed on the nearest stop to a GO halt. Fumbles for tokens, gate rejects the first one. Sigh. My third Presto snafu was at King Scotia Plaza entrance. Not my usual one but happened to be that day and I know that one has Presto so I extracted my card rather than fumble with a token. Two Presto gates on one side of the collector, one of which seems to be offline as it is dark. I try the other and reflexively tap the screen as if using a credit card terminal NFC interface, not heeding the down arrow. I resignedly start looking for a token as I step out of the path of the commuting horde. Finally I notice the sensor under the screen. Not easy to spot when you’re 6’2″ and the sensor is well below that. Oh, also what is with this business of Gateway selling Presto? TTC collectors should be clamouring to sell Presto in order to retain the sense of their position being relevant in the future. The GO agent who sold me mine took a minute to tell me about default tap, something I am unlikely to use but was seen by me as customer friendly. It also has one less holiday, Labour Day. Steve: October has Thanksgiving Day. There are 21 “weekdays” in October, only 20 in September. Not sure if holidays would result in more or fewer riders, but from the data July 1 was lower than average while Simcoe Day and Labour day seem to be similar to other Mondays. Actually it has the same number of Holidays, forgot about Thanksgiving but aside from July 1 holidays do not seem to have had a big impact. It will be interesting to see what happens to ridership around the Christmas Holidays and the school break in March when air travel peaks. Will UP express see a similar increase? Steve: The problem is that Christmas/School Break travel is not the “business class” UPX is designed for, and those trips to YYZ generally do not originate near Union Station. Steve, I read the section asking who would know where Cedarvale is? Yes, the park is south of there and in the park is an arena that used to be known as Cedarvale Arena. But isn’t the area just south of Eglinton West station where the Cedarvale Ratepayers live? I seem to recall (I might be wrong) that they heavily influenced the decision that cancelled the extension of the “Allen Expressway” down to Spadina. You might remember this….if so, well there is some history. Steve: Maybe, but you don’t name a station for a ratepayers’ group. BTW the former Cedarvale Arena is quite a bit south of Eglinton in the park, not an immediately adjacent feature. Bleah. Given Toronto’s extremely well gridded layout, and the very strong tendency for TTC stations to be at corners, the “Road-Road” naming system (“Eglinton-Yonge”, “Bloor-Spadina”) makes the most sense, and should be done *uniformly* across the system. which are perfectly fine exceptions. The GO stations are less likely to be at corners so it doesn’t work as well for all of them — it still works for “Bloor-Dundas” though! Yes, of course not, as this type of trip was not really even considered, although it is the dominant one, when the airport itself most needs help from direct to terminal service like UPX. Will there be Presto readers at all streetcar doors? All door boarding will not work without it. When I hear and read the name “Cedarvale” (and, mind you, I’ve only lived in Toronto just over 18 years now) *Scarborough* is what immediately pops into my head, as this is the kind of name I associate with planners and developers from early-to-mid-last century promoting the burgeoning suburbs with such bucolic names…. Steve: And Cedarvale (at Danforth/Woodbine) had streetcars on it! The short-lived Danforth Shuttle looped at Woodbine Station from 1966 to 1968 until the extension to Warden opened, eliminating the streetcar route. Cedarvale was the access to the loop. My own personal take on the process involved with naming municipal sites such as subway stations, is this: notwithstanding the historical or geographical significance of nearby entities (buildings, streets, parks, arenas, etc. – which have their own reasons for being named what they are), when assigning names to the stations themselves, one should assume that anyone using that station has absolutely *no idea* of anything about the city, neighbourhood landmarks, local history, or significant former residents. If I’m using the system, I want to know where I am and where I’m going in the simplest way possible without have to read “The Lonely Planet Guide” for Toronto. MAKE IT AS SIMPLE AS POSSIBLE from a 10,000-feet-up-in-the-air way AND PRETEND YOU DON’T LIVE HERE BUT ARE VISITING WHILE YOU ARE GOING THROUGH THE PROCESS OF ASSIGNING NAMES.” Don’t try to be “cute” or “fancy” or whatever. Be practical. And helpful to the travellers using the system! Totally unrelated to anything said so far but of interest is the new locomotives that Metrolinx has ordered for GO. These have twin 2 MW prime movers and AC traction motors. I would like to say that they have finally listened to me but almost all new locomotives have AC traction motors. The latest batch of NJ transit also has them. These should improve acceleration, fuel economy and trip times. Since they are converting 11 existing locomotives and buying 11 new AC locomotives it will be interesting to see what improvements these make. “To the complaints from many business owners that Metrolinx doesn’t provide them with firm enough timelines, Robinson said the contract in place with many of the organization’s tunnel contractors was inherited from the TTC ‘and, by any measure, is a crap contract,’ he said, requiring only 14 days’ advance notice for any work done. Yes $50,000 dollars is certainly a “stiff fine” on a contract in the hundreds of millions of dollar range. It will be built into their contingencies. And people were complaining the the $50 million penalty being applied to Bombardier was chicken feed. This is barely one seed. Steve: That claim is total crap. Metrolinx was fully in control of the contracts when the station work was tendered (by Infrastructure Ontario no less) and could have included longer notification periods. Saying this is a TTC problem is a cop out. True, but there are some out there who will believe that it is the TTC’s fault because they are a public institution who does not know how the “private sector” operates. After all they still employ “union labour” who demands a decent wage with benefits. God help us if we ever get “right to work” legislation. Sometime you should do a report on all the Metrolinx contracts that have dragged on forever. I am sure that there are lots of GO patrons who could provide you with the chilling details. What Steve, Sean and others are not factoring is parking costs. Regardless of where you are traveling from parking costs are the same for everyone. These fees account for a significant portion of cost of owning and driving a vehicle to work. Based on the daily costs of getting to work by car (parking, gas) it will always be much more expensive to drive to work on a per km basis the closer you live to work. In fact this ratio gets even worse ($/per km traveled) when you factor in all ownership costs (vehicle cost, insurance, licensing, maintenance). While living farther away costs more overall, it is much cheaper on a per km basis for car ownership. It might not seem fair to use a similar formula for GO users when you consider that ridership revenue is only used towards operating costs and not the capital costs, the reality is that GO is in fact competing against vehicle usage. And people make a decision to use transit (aside from convenience factors) based on a comparison of what it would cost compared to alternative methods of travel. Aside from that GO’s main function, at this time, is to reduce congestion caused from those traveling longer distances and not short distance users. Short distance users after all have more viable transit options available to them. As the system evolves (RER, electrification) it will eventually be better able to handle increased usage by short distance travelers and presumably/hopefully, the fare formula will change when the time comes. But at this time it is not ideal for GO to promote such usage and the system is not designed or priced to be convenient for short distance users because it would overwhelm current capacity limits. I’m sure none of this comes as a surprise to those in the know, but I am surprised at how this is conveniently being ignored. Steve: If we were prepared to pay the huge subsidies that car/park/GO trips entail to “regular” transit users, we could have much better service over all. The idea that somehow we should encourage people to live further away by giving them cheaper fares is one of the more original ideas I have heard in the fare debates. At least it’s a variation on fare-by-distance where long trips really do cost more than short ones. It is physically impossible for GO to build enough parking to hold the number of vehicle necessary to support very frequent RER service and hence make a huge contribution to congestion and pollution. Even GO recognizes how the “last mile problem” requires a fundamental rethink of their business model.